Absentee voters turned out at Honolulu Hale yesterday, the last day of absentee walk-in voting in this year's primary election. For information on times and how to vote in tomorrow's election, see below. High interest in the U.S. Senate primary election and the convenience of absentee voting have prompted a record number of people to vote early. Nearly 95,000 people have already voted absentee -- either by mail or at walk-in sites -- as of yesterday, the last day of absentee walk-in voting. That is already more than the record 79,276 people who voted absentee in the 2004 primary. And even more ballots are expected to arrive by mail before the polls close tomorrow, which should push the total over 100,000. "I wonder if there's going to be anyone at the polls, it (absentee voting) is going so well," joked Big Island County Clerk Constance Kiriu. Kiriu and other election officials are hopeful that the high absentee turnout will translate into a high turnout on election day. However, Rex Quidilla, a spokesman for the state Office of Elections, cautioned that absentee voting is not always a good indication of overall turnout. The number of absentee voters has been rising every election since 1992, and the number of people who vote on election day has been declining. In 2004 about 32 percent of the total vote, or nearly one in three primary voters, cast absentee ballots. That was up from 25 percent of the vote, or one in four voters, in the 2002 primary. This year, City Clerk Denise De Costa sent absentee ballot applications to all Oahu voters, which prompted a spike in mail-in applications and returns. 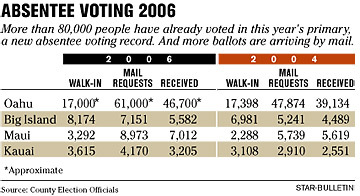 Nearly 61,000 people requested mail-in ballots, De Costa said. Candidates, political parties and voter registration drives also stress absentee voting. "Once you identify your base voters, you try to nail them in sooner rather than later because you're always afraid they will change their minds or not show up," said Ira Rohter, University of Hawaii-Manoa political science professor. At the walk-in voting site at Honolulu Hale yesterday, voters said they liked the convenience of voting on their own schedule. Li-Anne Dela Vega and Chris Tu said they will likely vote absentee again next election. "It's just easier," Dela Vega said. "I can do it when I have time," Tu added. Other voters said they came out yesterday because of the high-profile U.S. Senate race. Trina Nolasco said she usually does not vote in the primary, but did so yesterday because she wanted to vote in the Democratic primary for Senate and because the Honolulu Hale site "is convenient." Nolasco did not say for whom she voted. The high number of absentee voters will also have election officials and candidates watching to see if there is also an increase in the number of spoiled ballots because of people voting for more than one party. In 2004, 5,559 absentee ballots -- about 7 percent of the absentee vote, or about 1 out of every 14 ballots -- were invalidated because of multiparty voting. It is likely that most of the spoiled ballots were mailed in, because voting machines at the walk-in sites will reject ballots that are spoiled and give voters a chance to vote again. State election officials added a voter information sheet to this year's mail-in absentee ballot instructions to try to cut down on the number of spoiled ballots. County election officials are also reporting an increase in the number of people using the direct recording voting machines, which do not require a paper ballot and do not give voters the option of voting in more than one party's ballot. 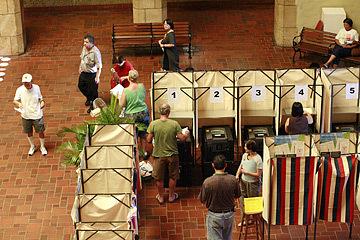 Glen Takahashi, city election administrator, estimates that about a third of the voters in the walk-up absentee election used the direct recording machines. Unlike in 2004, the new machines now have a printer attached that will keep a paper record of votes. Voters who used the machine yesterday seemed to like it. "It's like a computer," Virginia Dumbrigue said. "You don't have to fill in the little circles and make sure it's inside." Polls are open from 7 a.m. to 6 p.m. Nonpeak hours, when lines are generally shortest, are between 9:30 and 11 a.m. and between 1 and 4 p.m.
Bring a picture ID with a signature to verify your identity. Those using a paper ballot should not vote in more than one political party and the special nonpartisan offices ballot, otherwise your vote will not count. Also, mark the inside of the oval completely to make sure your vote is counted. Your polling place location should have been mailed to you on a yellow voter registration and address confirmation card. If you do not know your polling place, call the state elections office, your county clerk's office or the Aloha United Way's 211 information line, or go online to the polling place finder on the Office of Elections Web site at www.hawaii.gov/elections. Mail-in absentee ballots: If you have not mailed in your absentee ballot, you should drop it off at the county clerk's office by the time polls close tomorrow. Ballots can also be dropped off at polling places. Results: Visit us online tomorrow night for results.